I am starting to gather parts for my '63 Riv so it can be put together after paint. fasteners. Can anyone tell me where these can be found to purchase? Are the letters on a '64 the same? Mine are in good shape just want to know for later. The BUICK letters on the deck lid are a 63 only item. 64 had a Riviera script in the right hand corner. Mike, the letters are not held on by nuts from the back side. These are push pins similar the side horseshoe trim pieces. My lack of familiarity was evident earlier! Post removed. They look something like this. I don't know what size you need but I found these on the "Caddy Daddy" website. Am I right in assuming that you push these keepers onto the letter post then push the keeper & post through the hole in the hood? These keepers must be tiny! Yes, they are quite small. The barrel clips are installed into the deck lid then you push the letters in. I have a messed up set of 63 trunk letters (some pitting and a couple of broken studs) on reserve so I measured the studs for reference. Using a drill bit guide, the studs measure 1/8". But, the I in BUICK is a tab that fits into a slot, not a stud for a hole. I had no way of measuring the diameter of the hole in the trunk lid. 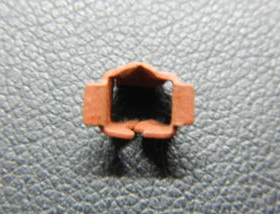 Caddy Daddy has a number of these barrel clips for 1/8" inch studs and different diameter holes. Sorry, you are correct. The '64s are scripted on the right side....my BAD. Also I found them on rebay from bestoffercounts. they are rectangle in shape measuring 7/32" by 3/16". Thanks for all who answered....that helped me figure out what they were. If I remember correctly those barrel clips are round. Are the pins on the back of your letters round or kinda squared off??? 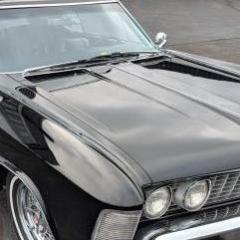 I am almost sure that on the insignia on the deck-lid for '64 & '65 they are round.. BUT IF James says the ones you pictured are correct get those. Although I don't think they are. They are round. If needed, I'll post pictures of the emblems themselves. I posted the diameter of the post earlier. They were square on my 63. Well that answers that question by two who actually own '63's. 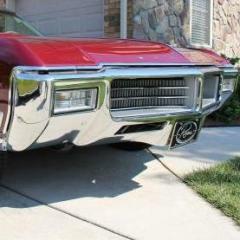 I have been following this thread because I have some "BUICK" letters that I obtained with a pile of first gen parts that I suspect are for the `63 Riv trunk lid. I`m confused as to whether the Riv letters had round pegs or square? I think Ed is correct regarding the letter "I" as I have one of those in the bunch and the square stud is broken off. It also makes sense they would use a square stud to keep the letter from rotating. James mentions needing 8 clips for the Riviera because the letter "I" uses a different clip? Maybe Buick had 2 versions of the letters? And the two 64's that I have owned had square pegs for the Riviera trunk script. I've got a couple of '64 trunk scripts and they're both fitted with rectangular tabs. I'm looking for one that is in really good shape. No pitting and shiny chrome. Some vendors claim to have repos but they're trying to sell '65 emblems as 64s. BUT they're different. The 64 sets close to the top and has a slight curve on the top or the R in Riviera. So, if anyone knows where I might find one, please let me know. FWIIW, I used a white construction/adhesive/sealer and glued mine in. Mine had clips but were loose and was worried they could go walkabout somewhere on the road. Being a white ‘63, none of the glue showed and it did a great job of sealing all the holes. Great saying! It conjures up all sorts of different visions!